Our favourite places, which we’re happy to recommend. The winter hiking trail on the Neunerköpfle is one of the most impressive winter hiking trails you’ll be able to find in the Tannheim Valley. Starting out at the Neunerköpfle cable car mountain station, there is a 1.5-kilometre path, which is especially cleared for winter hikers daily. After just a few steps, you’ll find yourself surrounded by breath-taking mountain scenery. You can watch paragliders take off, enjoy the peace and quiet and stop for refreshments along the way. A very sunny spot, amazing panoramic views. Whether you’re landscape lovers, hikers with sporting ambitions or sun seekers, the trail up to Zugspitzblick offers something for everybody. Having reached the summit, you can savour the view of the Zugspitze and the mountain restaurant’s wonderful cuisine. Up here you can also observe a large herd of deer at a game feeding station. As soon as conditions permit, Lake Haldensee becomes a haven for ice-skaters. 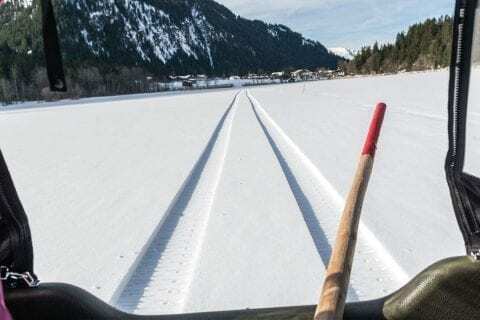 Twirling around on the frozen lake surrounded by majestic mountain scenery (with the summits Gimpel and Rote Flüh) is a truly magical experience. Step out of the door and ski. Obviously this is one of our favourite ski resorts. We had fun here when we were kids. 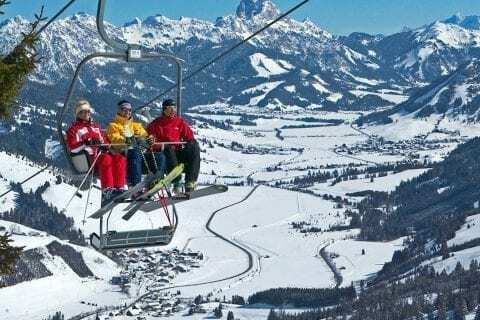 The great thing about this fairly small ski resort is the variety of different slopes – from the easy training slope for beginners to the FIS race course, it caters for all ages and abilities. You hardly ever need to queue, and the slopes are always immaculately groomed. The valley station is only 250 m away from Guthof Lutz. 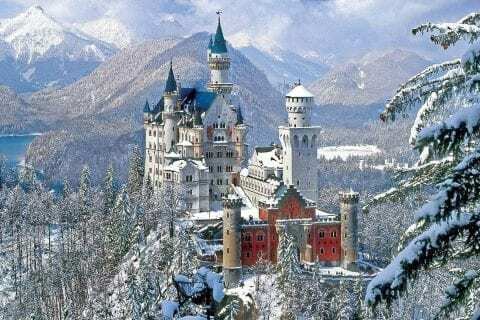 If after experiencing so much natural splendour in Tannheim Valley you want to find out more about the region’s art and culture, we recommend visiting the castles Neuschwanstein and Höhenschwangau. This should obviously also include a short detour to the historical town of Füssen on the River Lech. One of the most beautiful and spectacular vantage points in the valley is also open in winter. 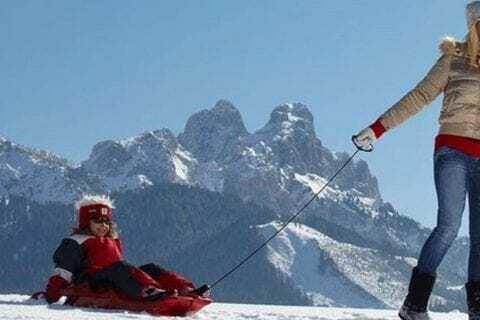 Uphill by foot and downhill by sledding along a gently winding toboggan run. Sensational fun!